Olentangy Liberty’s Grant Wilson (7) slices through a wall of Gahanna Lincoln defenders on a kickoff return during the first half of Friday’s Division I, Region 2 semifinal at Westerville North High School. 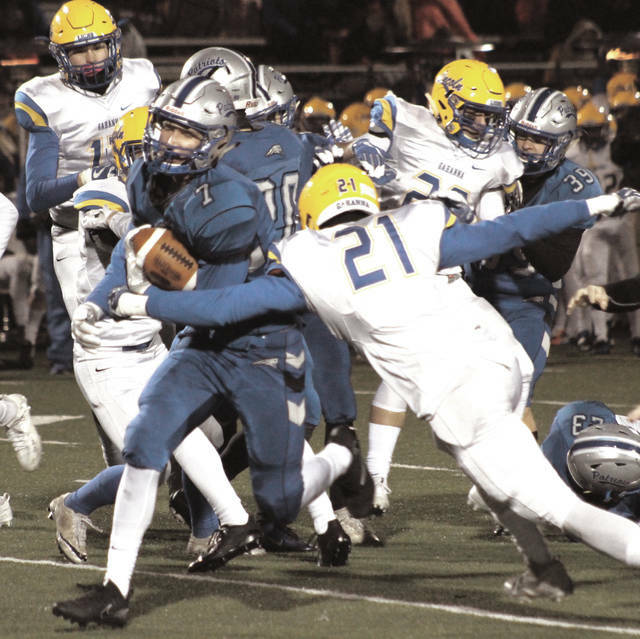 The Olentangy Liberty offense wasn’t able to do a whole heck of a lot through three quarters, but broke out in a big way early in fourth en route to a 17-14 Division I, Region 2 semifinal win over Gahanna Lincoln Friday night at Westerville North High School. With exactly 10 minutes to go, and the Patriots down 14-10, quarterback Mitchell Okuley fired a bomb down the far sideline for Ben Roderick and, well, Roderick did the rest. The junior receiver beat the Lions’ LaCarr Trent and strolled into the end zone for what proved to be a 56-yard, game-winning touchdown. Chris Osborne picked up a key sack to force the Lions to a three-and-out on the ensuing drive and Okuley scrambled for 37 yards on a third down to keep the chains, and the clock, moving on Liberty’s next series. The run moved the ball all the way to the Lion 16-yard line. Gahanna got the ball back with three minutes to go 80-plus yards, but the Liberty defense held on to secure the win. Ed Warinner sacked the Lions’ Mike Lowery on a fourth-and-three play to seal the deal. After the two teams combined for 73 points in their respective first-round wins, they combined for just 14 — one touchdown apiece — in the first half. Gahanna fumbled the opening kickoff but was fortunate enough to get it back. The Lions took advantage in a hurry, too, promptly driving it 71 yards for a touchdown on their first possession of the game. Lowery found Jerome Buckner from seven yards out to make it a 7-0 game with 10:05 left in the first quarter. Liberty turned running back Matt Webb loose on its opening drive as an eight-yard run, his third solid gainer of the drive, pushed the ball to the Lion 35. Another Webb run moved the chains again and a slant to Johnny Wiseman looked to get the ball into the red zone. A fumble, though, wiped out the gain and swung the momentum back to the Gahanna sideline. The defenses took over from there. Okuley rushed for 19 yards to move it to the Lion 29 on his team’s next turn with the ball. Gahanna forced a pair of fourth downs later in the drive, though, with the Patriots converting the first and failing to connect on the second when Okuley’s toss to Roderick sailed high on a fourth-and-11 play from the 19. The duo redeemed itself not long after that, though. Grant Wilson’s long punt return set the Patriot offense up at the Lion five and, after a holding penalty pushed the ball back to the 15, Okuley and Roderick hooked up for a 15-yard scoring strike to even things up at seven with 7:07 to play in the first half. Buckner struck again with a 62-yard TD run on the Lions’ first play of second half. He went around the end, found the corner and beat the Patriot defense to the house to make it a 14-7 game with 9:56 left in the third quarter. The Patriots picked up a handful of huge conversions to keep their next drive alive before senior kicker Dante Leary booted a 27-yard field goal to make it 14-10 with 4:31 left in the third quarter. Webb picked up a huge fourth-down conversion from the Gahanna 30, collecting a hard-fought three yards on a fourth-and-one play and, on third-and-12 from the 28, Okuley went deep to Roderick. They didn’t connect, but a pass interference gave Liberty a first down and a shot at the pivotal kick. Th wins sets up a showdown against Toledo Whitmer — a 32-29 winner over Olentangy — in Friday’s regional final at a site to be determined. https://www.delgazette.com/wp-content/uploads/sites/40/2017/11/web1_return_cmyk-2.jpgOlentangy Liberty’s Grant Wilson (7) slices through a wall of Gahanna Lincoln defenders on a kickoff return during the first half of Friday’s Division I, Region 2 semifinal at Westerville North High School.